Set on the side of a woodland hill just 10mns out of the popular town of Pontivy, you will find this luxurious home set 10 acres of grounds. The house itself was built back in 1815 and was completely renovated in 2008-2009 to become an executive finish family home. On the ground floor you have a large lounge with fireplace and French doors out on to the large terrace area, then you have the dining room and a large modern fitted kitchen with breakfast area. Following on you have a study, downstairs cloak room and a utility room. Then upstairs, passing by the landing area with its panoramic views out over the valley, you will find three gorgeous bedrooms, the first is the master bedroom with en suite bathroom with bath, shower and toilet, as well as a dressing room; then you have two spacious guest bedrooms, both with en suite shower rooms. Outside you have a separate longère which is presently used as storage but could convert to other accommodation or stables. 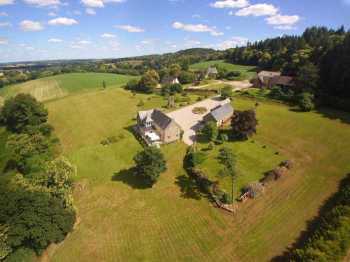 The whole property sits in 10 acres of grounds which slope of away from the house down to the stream at the bottom. Bay-window. Fireplace, Double glazing. Internet, Electric window shade.